Photo by Bill Walsh, courtesy Oregon State University. Seems to me that for every unit of effort we put into protection and restoration of wilderness, nature responds 100 fold. We stand on the shoulders of a healing giant. While there is mounting evidence for localized spillover, there have been no empirically documented cases of MPAs seeding unprotected sites, which has impeded acceptance of this management tool. 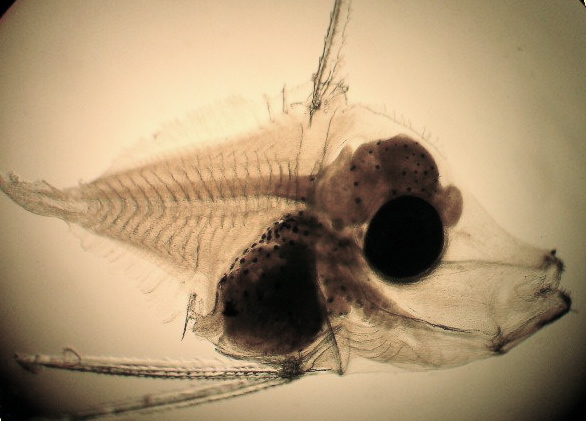 Seeding is a form of population connectivity, which, in marine metapopulations, is characterized by the dispersal of planktonic larvae among local populations. Recent empirical efforts to track larval dispersal have demonstrated localized self-recruitment, but have not documented larvae seeding distant or commercially fished sites. Photo by Sarah McTee, courtesy Oregon State University. 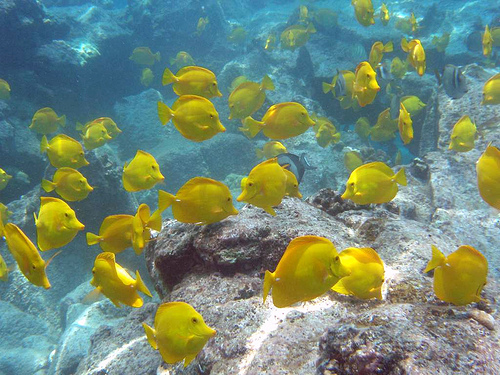 The study focused on populations of yellow tang (Zebrasoma flavescens) off the Big Island off Hawai’i. These fish are important players in their world, helping to promote coral growth by browsing on coral competitors, marine algae. 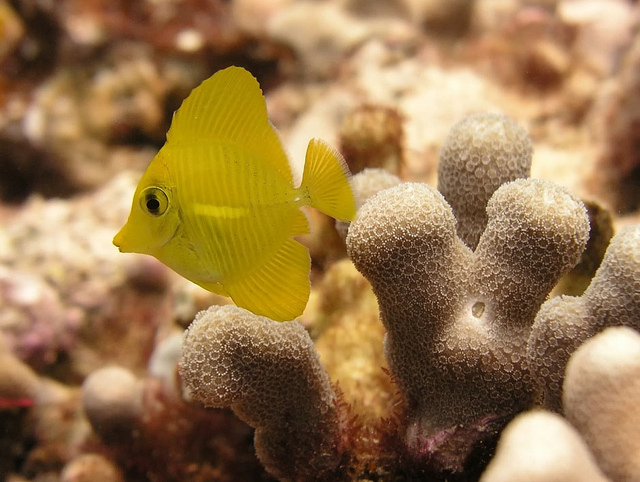 But the tangs are also one of the most popular aquarium fishes and the top export from Hawai’i. Ten years ago the fishery was on the brink of collapse. So in 1999 the state of Hawai’i established a network of nine marine protected areas along the west coast of the Big Island, which effectively prohibited fish collecting on 35 percent of a 150-kilometer/93-mile coastline. The fishery quickly recovered. But did nature respond with spillover into the unprotected areas? Determining patterns of larval dispersal is especially challenging due to the minuscule sizes of larvae and the vast ocean environment through which they travel… Therefore, we applied a new genetic parentage method to directly determine how far and to what extent the larvae of an abundant coral-reef fish disperse from their natal populations. 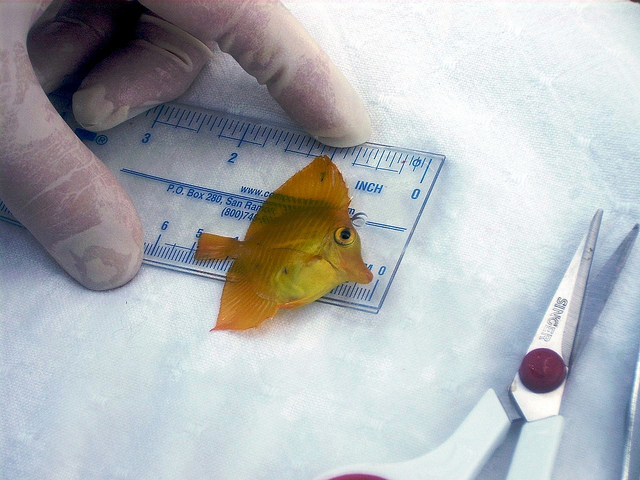 [W]hich is remarkable given the approximately 54-day pelagic larval duration and the large number of yellow tang around the Island of Hawai’i… All identified offspring were found between 15 and 184 kilometers to the north of their parents, suggesting that ocean currents played a substantial role in larval dispersal. Juvenile yellow tang about the size at settlement out of the pelagic zone onto the reef. Photo by Mark Hixon, courtesy Oregon State University. In addition to demonstrating the seeding effect of MPAs, documenting connectivity among marine populations has an important social and economic role. 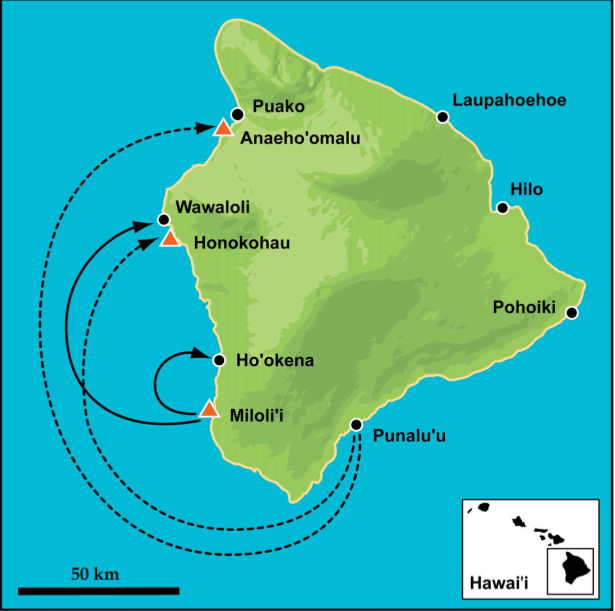 The identification of connectivity between distant reef fish populations on the Island of Hawai’i demonstrates that human coastal communities are also linked: management in one part of the ocean affects people who use another part of the ocean. Understanding connections at all levels is the foundation for truly effective ecosystem-based management. ♥ Mark R. Christie, Brian N. Tissot, Mark A. Albins, James P. Beets, Yanli Jia, Delisse M. Ortiz, Stephen E. Thompson, Mark A. Hixon. Larval Connectivity in an Effective Network of Marine Protected Areas. PLoS ONE. 5(12): e15715. DOI:10.1371/journal.pone.0015715. I ♥ open access papers.